Tourist may not be flocking to the area just yet, but they are starting to research locations, lodging, and activities for their annual family vacation or buddy fishing trip this spring and summer. In fact, some may already be making reservations as you read this. Having a great website with eye-catching photography, valuable and updated content, and easy to understand calls-to-action definitely places you one step ahead of the competition. However, if you are not focused in on who is visiting your site, downloading your guides, or putting in their information in the form posted on the “Contact Us” page, then you may be losing leads as quick as they come to your website. If you think you are missing out on valuable leads, read the following to learn tips to help you convert your leads into customers through a little thing called “nurturing”. Lead nurturing is when you begin a relationship with a potential buyer by offering information or content they need or want in a way to keep them engaged and hopefully converted into a paying customer at the end. Think of lead nurturing like trying to reel in the perfect catch when you are fishing. Like fishing, you spend time looking for a good location to drop your line. Once you have a few in your sight and interested in the bait you are offering, you have a choice to make. You could quickly reel in your line and hope that you have a prize winning fish at the other end or you could take a little time and “nurture” the situation. And with a little nurturing of the line, chances are bit higher that after a few nibbles that you will see your big catch at the end of the line. The same is true for leads coming into your website. If you do nothing, then they go away. However, if you are willing to put in a little effort, then you will see greater benefits. According to Forrester Research, companies that nurture their leads see 50% more sales-ready leads than their non-nurturing counterparts at a 33% lower cost. 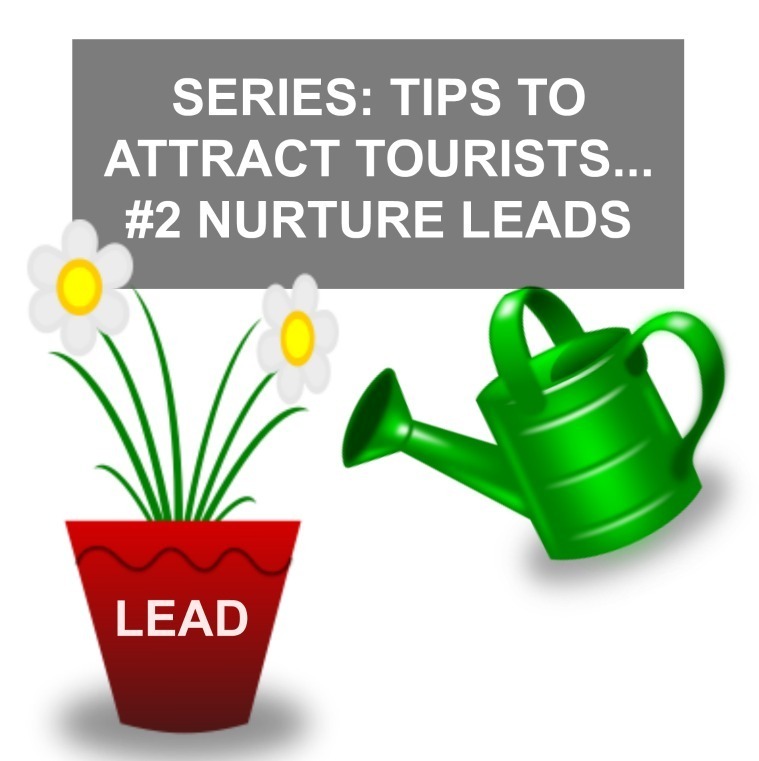 So what do you do to nurture those leads? There are quite a few things you can do, but to keep things simple we will discuss only a few. For starters, many people who visit your site and fill out a form are generally asked for their email address. If you have an email address, then you should be sending out an email. When the person downloaded the Guide to the Best Swimming Areas, did you email them a “thank you” beyond the generic one sent immediately after the download? Did you respond to the inquiry sent in on your website “Contact Us” page? Following up with a personal email is a huge way to nurture leads. It lets the person know that they have been noticed and heard and that the person on the other end is real and not a computer. Adding a little personal touch can go a long way when trying to convert your leads. If you look into your website’s analytics close enough, you can also see what visitors are looking at on your website. Taking your lead’s behavior into account can be beneficial. For example, if your visitors are looking into room rates and amenities, you may want to send out an email with your latest rates and offer to help if they have any questions. If they seem to be interested in things to do around your resort, you may send them an email with links to local events happening or your latest blog covering summer activities. When it comes to turning leads into customers, there isn’t a magic equation. Leads are only good if you are willing to make the effort to go after them by putting in a little more time. VisionAmp Marketing can’t force you to go after and monitor the leads going to your site, but we can help with the nurturing part of lead conversion. If you don’t have the time to create informative blogs or guides to help your clientele, then let VisionAmp create them for you to post on your website and send to clients you are trying to convert into customers. To learn more about our Content and Digital Marketing, visit our website or give us a call today at 870.580.0909 to get the conversation started.